Price on Application, starting from USD $11,500.00. Please email us for more information on pricing and availability. Minor variations to weights, measurements and balance point will occur as this is a handmade sword. 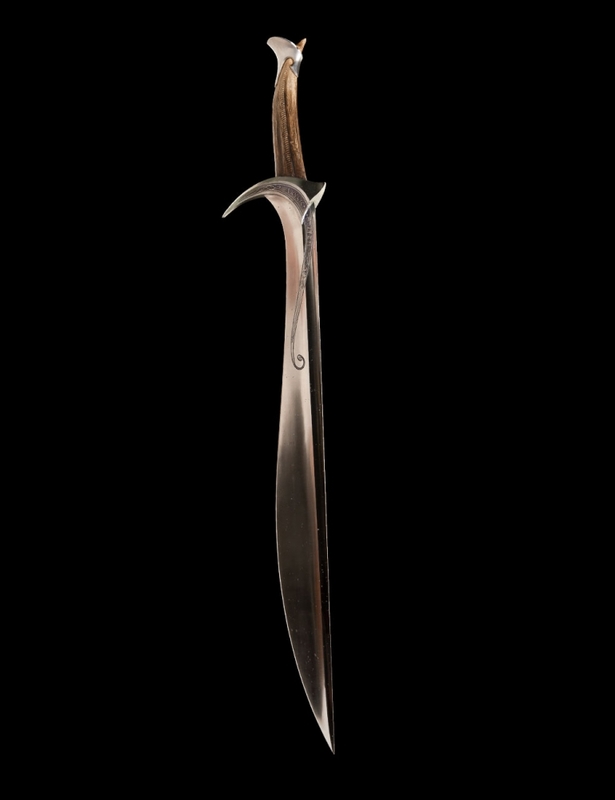 Forged long ago in the lost Elf kingdom of Gondolin, Orcrist, the ‘goblin cleaver’, was a legendary blade, well known to the wise of Middle-earth and infamous among their enemies. Having disappeared for centuries, the sword would reappear in, of all places, a Troll hoard, where, among the detritus and ruin, it catches the eye of Thorin Oakenshield. No finer sword could a king of any race wish for. 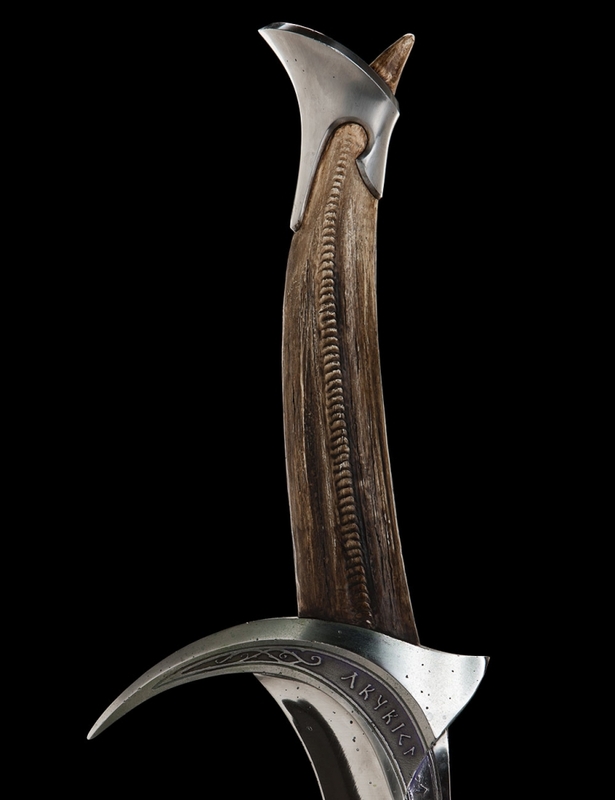 Own a piece of fantasy art of the highest calibre with Orcrist - the Sword of Thorin Oakenshield. 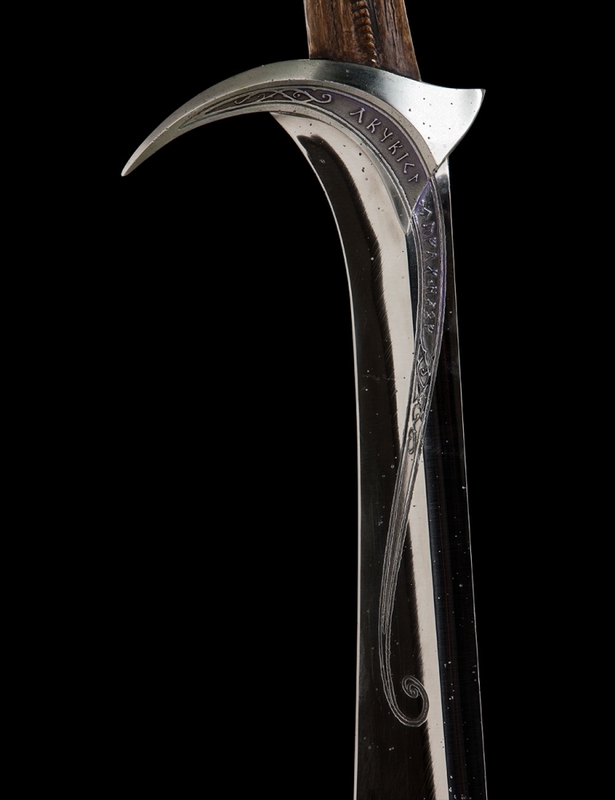 Orcrist was designed by Weta Workshop senior concept designer Paul Tobin and made at Weta Workshop in New Zealand for The Hobbit: An Unexpected Journey by Master Swordsmith Peter Lyon, with leatherwork crafted by expert costume technician, Darin Gordine. The fifth sword in Weta's Master Swordsmith's Collection, Orcrist takes swordmaking even further than previous swords in the series. A single-edged blade, it encompasses a multitude of swordmaking, metal-crafting and woodworking techniques. 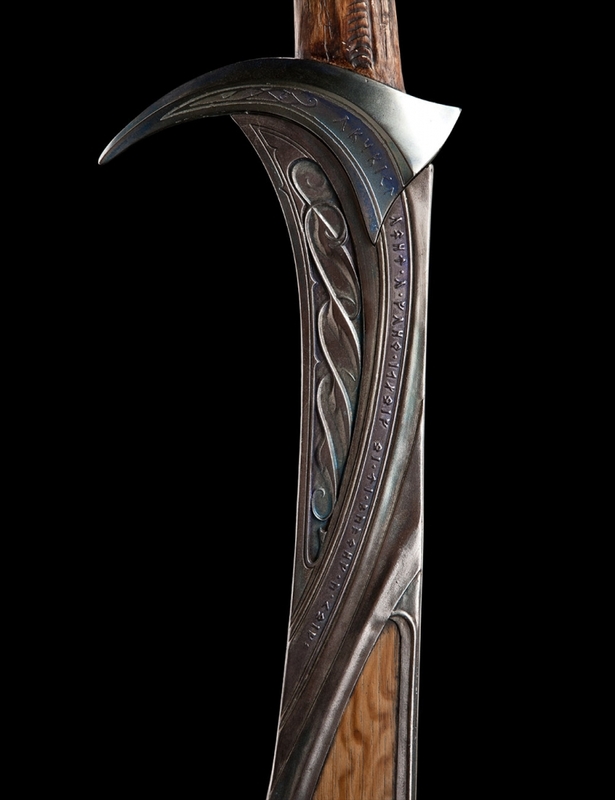 Orcrist is made with the same attention to detail that the swordsmiths of the lost realm of Gondolin would have required. 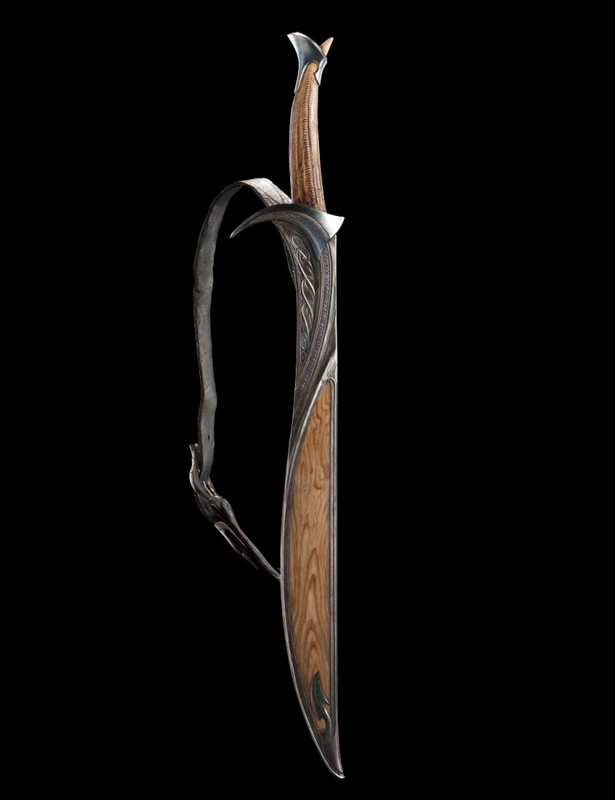 Peter Lyon took Paul Tobin's design and created a piece of art and a usable weapon wrapped in one. The blade is made from tempered spring steel and the dragon's tooth grip is cast from CC60 urethane, painted and sealed under resin. On the cross is the name "Orcrist" etched in runes and the gently curvaceous blade, ground from spring steel, features etched elven runes stating "The Serpent's Tooth". On the pommel are four cubic zirconia gemstones inlaid. The scabbard is made from a combination of white oak and steel and connects to the leather belt with leather straps and buckles. The inscription translates as "Born from the Maws of Dragons I am Always Hungry and Thirsty". Orcrist's intricate leatherwork has been hand-crafted by Darin Gordine, who contributed many of the costume components and weapons rigs for both trilogies. The belt is made from embossed leather with steel buckle, loop and tip. It features straps for attaching the scabbard. 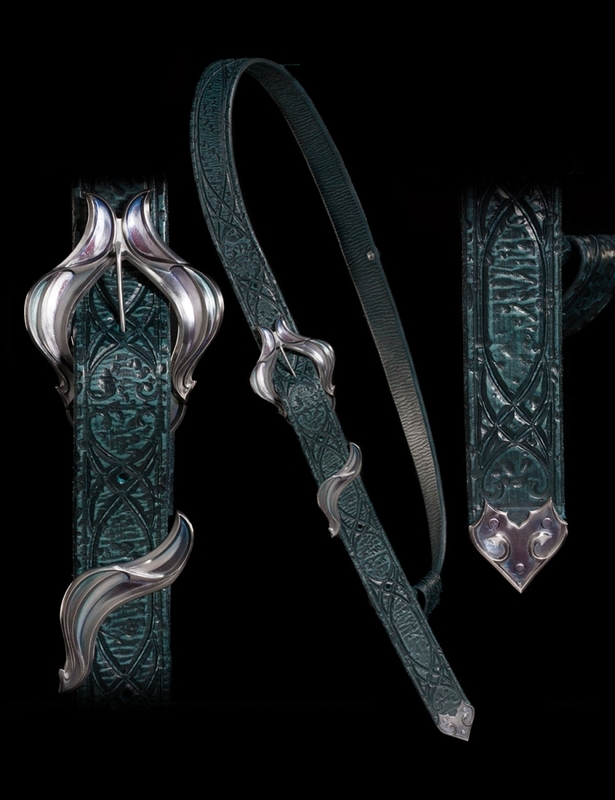 Thorin wears his sword on his back and this belt is designed to be worn over the shoulder. 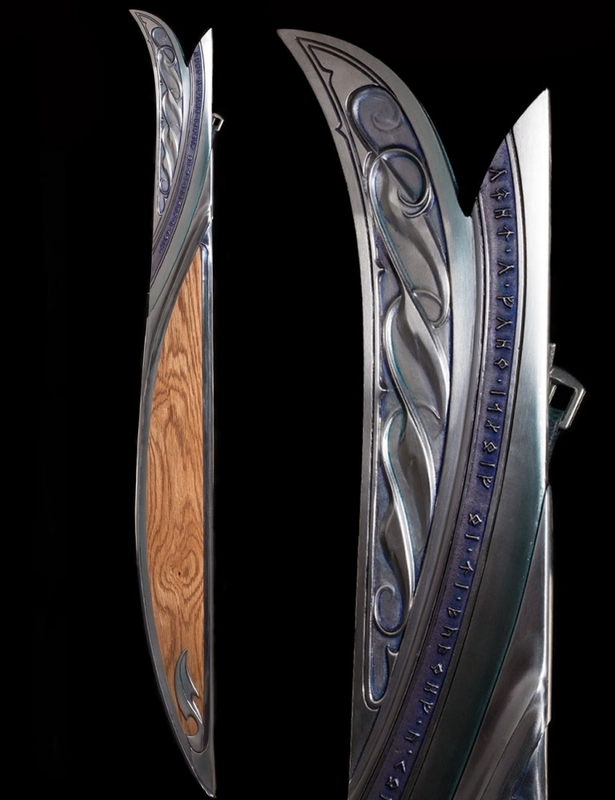 This sword and its accessories are the absolute epitome of craftsmanship. For more information, please email wholesale@wetanz.co.nz. Balance Point: 2.8 in (70 mm) along the blade, measured from the tip on the hand guard (see image on left).